“ Just do one thing. During the day, in the group, look at least ten or fifteen times to see whether your stomach is relaxed or tense. If it is tense, relax it — just the stomach. If it is tense you collect any energy that is around, and it is dangerous, because these groups release so much negative energy. They are meant to do that, and people who are releasing it will not be affected, but leaders will be if they are not relaxed. So if you see that the stomach is tense, relax the belly and breathe by it. Make it a habit by and by that you don’t breathe by the chest but by the belly. There are very many false notions about breathing, and almost all over the world, people have started breathing by the chest. 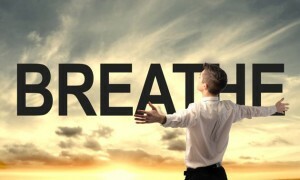 Breathing by the belly relaxes your whole being — your psyche and soma, both — and society does not allow a relaxed being. He will be spontaneous, and he will move moment to moment. You cannot enforce rules on him. He cannot be regulated, regimented, manipulated. He will be like a child — and you cannot regiment a child. The moment you succeed in regimenting a child, he is dead. Near the age of four, all children are massacred. Then they just live for the namesake. Just a dead thing continues, but the real has left. The day they leave spontaneity, they have died. The average limit of human beings is four years old, and after that we pull on, drag on But life disappears so of course no blooming ever happens, no fulfillment, no benediction . So do it in the group, and also when you are not taking a group. Only when it has become a natural thing can it help you in the group. And by and by it comes naturally, easily. Then there is no need to remember it — you simply breathe by the stomach. Then you will never absorb any negative energy. Just the opposite starts happening — you start absorbing positive energy. A tense being is hankering for some negativity, is trying to find some excuse to go sour and bitter. When you are relaxed, you become sensitive to a different level of energy the positive. It is as if a negative energy person comes near a rosebush. He will count the thorns; he will not look at the flowers. The flowers are also there, but he will somehow miss them; he will overlook them. When a man with positive energy, relaxed, comes near a rosebush, the same rosebush, he doesn’t start counting the thorns. They are there, but somehow they don’t matter. He looks at the roses — and the roses become so overpowering, so overwhelming, that who bothers about the thorns? If you count the thorns, you will become depleted, angry, dissipated. You will be in a very bad mood… you will become a thorn, because whatsoever you absorb, you become. That is the meaning of the old adage: Whatsoever you eat, you become. It doesn’t mean simply the food. Whatsoever you eat — and that includes all the vibrations that you take in — you become. If you go on absorbing negativities, you become a wound, and anybody who comes near you will be offended by your being; will be hurt by you in certain ways. You cannot help it; you are a wound. Your pus is overflowing to other people in your relationship. The wound is going to stink. So it becomes a vicious circle: when you have a wound, you absorb more negativity. Then the wound becomes bigger and bigger and bigger. So start relaxing the stomach and breathing by the belly. Make a practice of it. Lying down on the bed before you go to sleep, for three or four minutes breathe by the belly. In the morning when you awake, breathe by the belly. Just do it whenever you remember. Have more feeling for the belly. In Japan they say: Think by the belly. Even thinking can be done by the belly — then a man becomes perfectly relaxed. For centuries in Japan they had been thinking that the real thinking process was in the belly, not in the head — and they are right. There is a different quality of thinking which goes on in the belly… it is intuitive; what you call a hunch. Women think more from the belly than men. Man goes on groping in the dark with logic. Women simply jump to conclusions without any process in between. That’s the problem — man cannot understand how women come to their conclusions. And almost always they are right — illogical, but right. They live on hunches. And of course they have a more empty belly than man. They have a womb inside, and they have more space inside. Next PostWhat does this mean?